This edition is the culmination of years of efforts to document and improve the state of the art in cost-effective public transport solutions for cities. It includes contributions from a wide range of professionals and practitioners with direct experience in designing and implementing BRT systems all over the world. The chapters of the guide are grouped in volumes. Within these volumes are 33 chapters that touch on a variety of topics essential to the planning of a BRT system. Content has been expanded based on recent projects, which have deepened the base of knowledge for this guide. Volume 1 lays the groundwork for initiating a Bus Rapid Transit (BRT) system from the initiation of a project to sparking real momentum that will bring the project into reality. Volume 2 runs through the necessary preparations and calculations needed to plan out the operations of the BRT project in order to optimize its service frequency, capacity, and ridership. Volume 3 details the necessary steps to building a communications strategy to be used for engaging the public with the BRT project, educating customers on how to use the system, and marketing the project to a wide array of potential users. Volume 4 looks at the necessary planning required to ensure the financial stability and success of the business of running a BRT system. Volume 5 provides details on a number of technological systems that are required to all work together in synchronization for a BRT systems to run smoothly. 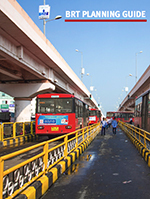 Volume 6 provides detailed guidance on the physical infrastructure that are required of a BRT system as well as their management and costs. Volume 7 goes into the potential for BRT to extend beyond its stations, vehicles, and corridors, and compound its environmental, social, and economic benefits to the greater transport network of non-motorized transit, while encouraging effective transportation demand management and transit-oriented development. Volume 8 presents the goals and functionality of Online BRT Planning Guide. We are excited to have this version online. This will allow for more dynamic updating and more involvement from the community. We are also developing a PDF version for download and use offline.